At the end of 2013, I rambled and raved about how much I loved The Humans and then posted an adoring review of it earlier this year. It was easily one of my favourite books last year so I was extremely excited to be approved for Haig’s first foray into the world of YA fiction on NetGalley. When I read books like Echo Boy, I kind of wish that they’d been around when I was younger. Maybe they were and I just missed them but my early teen years were populated by Point Horror, Sweet Valley High and a miscellany of random sleuthing novels. Although I was as much of a sucker for the Point Horror novels as many other teens of the 90s, I sort of skipped “YA” and went from Goosebumps to the adult section. What I think there seems to be much more of being done particularly well these days (over a decade later) are genre books that tackle more adult themes, such as grief, love that doesn’t revolve around the cutest boy in school and mental health issues in a more accessible way. Echo Boy takes a version of the future (that is actually worryingly believable) where technology has been developed in sort of an I, Robot type way, with families relying on computers and robots for education, travel (or the virtual variety), as well as for housework and for generally tackling the grungier side of life. Audrey’s father is out-spoken in his belief that humanity should be getting back to being more self-sufficient, warning of the dangers he sees in a world where robots are everywhere. 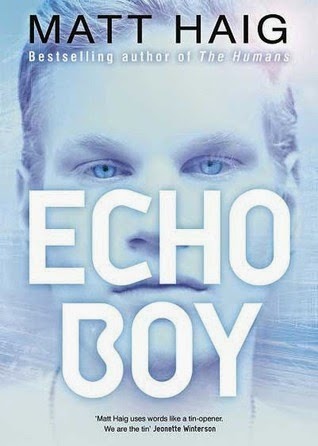 It’s a tried and tested premise and I enjoyed Echo Boy. It was well-paced and kept me entertained on a good few nights while I was facing down a sleep-defying bout of sciatica earlier this year but it didn’t stack up against The Humans. I was going to try to avoid the comparison but there were a lot of similarities in the themes. Both have a non-human learning more about what humanity is and what it can mean and both have a pressing risk of danger borne out of a protaganist’s difference (weaving in a bit of dealing with prejudice for good measure). Echo Boy was a perfectly adequate (good, even) sci-fi tale but it wasn’t outstanding. I think that what my disappointment really came down to was that everything was just a little bit too predictable or a little bit too light (albeit with a couple of notable exceptions). It’s tricky to explain because the blurb doesn’t give away a lot so I’m reluctant to either but Audrey deals with grief and depression; patches have been developed that can suppress negative emotions but the benefits (or otherwise) of using them is dealt with neatly and sensitively. Much of Audrey’s decisions and actions, though, are either obvious or a bit…stupid. She’s remarkably slow on the uptake, particularly when it comes to who she should or shouldn’t trust, and it’s more than a bit frustrating. Daniel is a stronger character and much more interesting but isn’t exactly perfect. I loved how he was an echo (the name used for robots) but so irrepressibly human, an individual experiment designed to imitate emotion. It’s all well done; is it our feelings and desires and flaws that make us human or is it our flesh and bones? The only point I wasn’t sold on was Daniel and Audrey’s relationship. I know that Haig can write believable, meaningful love but this wasn’t it. I was ready to buy into Daniel being more than a robot and I would have bought into his being able to love but, as ever, I just can’t get on board with InstaLove. I sound like I’m moaning. I’m not trying to, I’m just trying to say that this is a good book and that how much you enjoy it will probably depend upon what you’re expecting (i.e. whether or not you’ve read and loved that book that I’ll try not to mention again until I wrap up…). I like the ideas and Haig is a great writer so they’re done well, just in a way that I felt lacked depth. I wanted more of Daniel, more of his background and more on the world and the background. There was a bit set in a zoo that featured creatures (including some Neanderthals) brought back from extinction that was both fascinating and kind of heart-breaking and it was over too soon. So this is a good, light touch sort-of moral book with plenty of action and some classic bad guy behaviour but it wasn’t the tear-jerking, twisty science fiction tale that it I really felt like it could have been. Overall: Although Echo Boy won’t be one of the best books of the year for me, it is one of the considerably better shifts from adult to YA by an author that I’ve read. I wouldn’t think twice about recommending it to young adults or to the more dedicated YA fans but if I were to be recommending a book that looks at inter-species relations, loss or really what it means to be a human, it would be The Humans every time. Source: Received from the publisher via NetGalley – thanks, Bodley Head Children’s Books! Top Ten Tuesday: It's Summer TBR time!